Life, universe, and everything - does it all have a purpose? As I said last week, the purpose of any physical object lies outside that object. Therefore the purpose of the universe, if it exists, must also lie outside the universe. No amount of searching only within the universe will discover it. Furthermore, the purpose of the universe may be focused on a very small portion of the universe: this, too, is in keeping with what we already know of the purpose of physical objects. So, the universe may have a purpose. Neither its large size, its great age, or the failure of science to find that purpose within the universe is any evidence against it, for the use of these criteria immediately leads to false conclusions for objects which are known to have a purpose. But, if these are the wrong evidence to consider in searching for that purpose, what is the right evidence? What will allow us to go from "the universe may have a purpose", to "the universe does have a purpose", to "this is the purpose of the universe"? As always, we apply Bayesian inference: a feature of the universe is evidence for the hypothesis that best explains, anticipates, or predicts that feature, and against the hypothesis that is comparatively worse at that task. To begin, let's apply this technique on something smaller, and therefore easier to understand, than the universe - like a book. If a rational but ignorant alien came to the Earth and saw a book, what could he do to decide whether it has a purpose? Simple: according to Bayesian inference, he would take those two rival hypothesis - "this book has a purpose" and "it does not have a purpose" - then compute the probability that the book would have the features that it does starting from these hypothesis. Each feature would then be evidence for the hypothesis that calculated a higher probability for that feature. So, upon looking at a book, the alien would look at its peculiar shape - flat, rectangular sheets of paper of equal size stacked on top of each other and bound on one end - then compute that this is a highly unlikely shape for an object with no purpose. On the other hand, even if the alien does not know the exact purpose of a book, he knows that an object with a purpose would not be randomly made. Thus eliminating the randomly made objects from the possibility space, our alien could then compute a higher probability for an object with a purpose to take the shape of a book. Therefore, the "purpose" hypothesis better predicts the shape of the book than the "no purpose" hypothesis, and the shape of the book counts as evidence for the book having a purpose. Notice that this neatly comes down to a simple question: what are the chances that the book would have its peculiar shape? Is that shape something that could come about randomly without a purpose, or is it unlikely and specific enough so that a purpose is the better explanation? This is a universal criteria: it applies to all kinds of objects. You can walk into some workshop or studio or kitchen that you know nothing about, apply this criteria to the objects in it, and correctly infer whether these objects have a purpose. Is that chunk of clay just leftover waste, or does it have a purpose? Are those chopped up vegetable parts going into a dish, or will they be thrown away? Does that sheet of paper have any writing, diagrams, or special folds on it, or is it in a state that could have come about randomly? Our approach handles all these situations, and correctly decides whether the object in question has a purpose. So, our alien then concludes that the book has a purpose: its shape is peculiar enough that it is unlikely to have come about by purposeless chance. Note that the strength of this conclusion depends precisely upon how unlikely that is: if our "book" is only two sheets of paper stacked on top of each other, that might have come about through chance, and therefore the alien's conclusion is weak. But if our book is an intricate popup book of many pages and detailed construction, that is highly unlikely to have come about through chance, and our alien's conclusion is strong. Note also that, as I said last week, nothing here depends on the physical size of the book. There are huge books with huge prints, whose largeness sends its own message and thereby serves its purpose. There are also tiny books: electronic books take up a minuscule amount of physical space. Also, the purpose of a book will never be found within the book itself. Even if it were to contain the words, "this book was written so that...", they would be meaningless unless it were actually read by someone, and that someone obviously cannot be the book itself. Meaning and purpose are always found outside the object itself, yet their existence can be inferred from the state of the object. As I said, all this is generally applicable, as you may see for yourself with any of the objects around you. We can now apply this to the universe: does the universe have a purpose? Well, what are the chances that the universe would have the features that it has? This is not some arcane non-question that cannot be answered. Through science, we know a great deal about the features of the universe, and we know that these are NOT the features that a random universe would have. This is the fine-tuning argument: a random, purposeless universe is highly unlikely to result in a universe like ours - so unlikely, in fact, that in any normal, everyday usage, we would simply call it "impossible". This leads to the very firm, very strong conclusion that the universe does, in fact, have a purpose. Next week, we will examine how to determine what that purpose is. 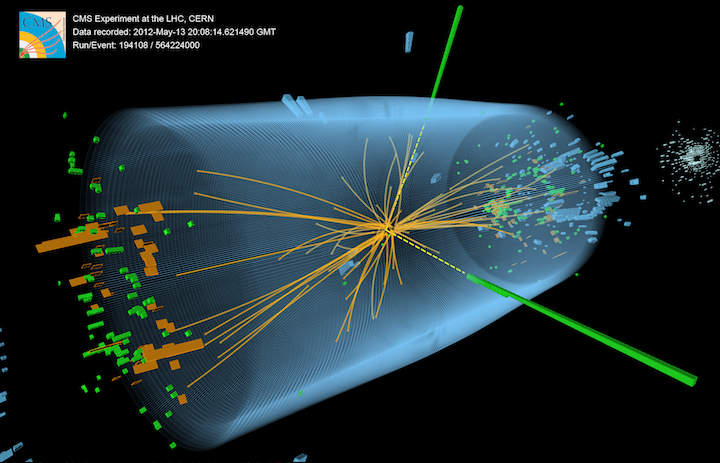 Image: Candidate Higgs event from CERN, from Wikipedia Commons. "If the purpose of the universe is to create humans, why is it so inefficient? Humans have only been around for 200,000 out of the 13.8 billion years that the universe has been in existence. We only exist on one planet among the innumerable stars in a vast universe. We are, in every sense, infinitesimally minuscule in comparison to the rest of the universe. In light of this, is it not obvious that ascribing a purpose to the universe is merely wishful thinking, born out of human hubris?" I had earlier claimed that the universe exists, not even for the sake of humans, but for the sake of one particular human: Jesus Christ. I am therefore compelled to answer the thought expressed above. Quite simply, this thought is immediately falsified upon direct comparison to many thing that are already known to have a purpose. Upon such comparisons, it's easy to discern its fundamental mistake: it assumes that the universe is only matter, and therefore could only have matter as its possible purpose. This, of course, is the mistake that a simple reductionist would make. The truth is that purpose or meaning can only ever be found outside the object in question, and therefore will always escape you if you only consider any object by itself, as only matter. This is as true for the universe as it is for anything else. Let's take the most immediate example: you are currently reading this blog post. You might be using a computer to display the webpage on a monitor, which then shoots out the photons that enter your eyes, allowing you to see the webpage. Now, if the purpose of your computer system is to display things, why is it so inefficient? Over the lifetime of your system, about a joule's worth of photons enters through the pupils of your eyes. This is minuscule in comparison to the mass-energy content of your computer system, which is about 10^18 joules. Why can't the computer deliver a significant portion of that 10^18 joules into your eyes, if that's its purpose? In light of this inefficiency, is it not obvious that ascribing a purpose to your computer is delusional, born out of the inflated sense of importance that you attach to your eyeballs? Of course, thinking that way is ridiculous. Yes, the purpose of your 10^18 joule computer system really is to send a joule of photons into your eyes. You know this because you in fact use it for that purpose. Yet you have never wondered at the "inefficiency" of the system, and never held that inefficiency as evidence against a purpose. Why would you start doing so with the universe? The mistake in this ridiculous way of thinking becomes obvious upon a moment's reflection: the purpose of the photons from your monitor is not to deliver energy, but information. You would only hold the "inefficiency" of your computer system against it if you only thought in terms of energy, and failed to think on a higher plane, where that energy delivers information. Likewise, the purpose of humans is not to occupy space, or to take up time, but to glorify God. You would only think the universe was "inefficient" at producing humans if you only considered humans as merely matter, and failed to realize that humans are primarily spiritual beings. You may say that this comparison fails, because the computer is not actually inefficient: all of its parts are necessary to produce those photons which eventually enter your eyes. But the same is true for the universe: the amount of matter in the universe, and the rate of its expansion, needed to be precisely fine-tuned for it to produce life. So if the computer is not inefficient, I say neither is the universe: its great mass, size, and the age are all necessary to produce us humans. The original "inefficiency" argument then simply fizzles. You may also say, "Aha! I'm actually reading your blog on a smartphone, which is smaller than a desktop and therefore more efficient! Just as smartphone technology represents an improvement over the desktop, wouldn't the universe be improved if it were more efficient at producing humans? A universe consisting of just the Earth would be a much more efficient, much better universe! Doesn't the low efficiency of the actual universe speak against God's capabilities as the creator?" Not at all. We only value smaller computing devices because we are limited in our physical capabilities: we cannot lug around our desktop everywhere. The same goes for other measures of efficiency. We value a high gas mileage in our cars because we only have a limited amount of gasoline available to us. But God has no such limitations: it is no more trouble for him to create a hundred billion galaxies than it is for him to create a single atom. For him to wait ten billion years for life to begin was no more trouble than to wait one second. Even if the entire rest of the universe existed solely to look pretty for us, that would be no argument against God, as it would have been no trouble for him to create it. But more importantly, the "inefficiency" of the universe actually serves its purpose. The medium is the message. Remember, the purpose of the universe in Christianity is not just to produce humans, but to allow Christ to be incarnated into it, so that God may draw us onto himself. In light of this, the "inefficiency" of the universe due to its large size actually serves to highlight the infinite power and majesty of God, and therefore serves its purpose by allowing us humans to appreciate God's glory. The size of the universe is in fact an argument FOR God, because his purpose is better served by the enormous size of the actual universe. Do you doubt my argument? Consider Mt. Rushmore. In a purely physical sense, the purpose of Mt. Rushmore is much the same as your computer: to put some photons into your eyes. But Mt. Rushmore is more massive than your desktop by many orders of magnitude, and therefore far less efficient. Now, should you count the "inefficiency" of Mt. Rushmore against the capabilities of its creator, or the idea that it has a purpose? Would Mt. Rushmore be improved if it were only two feet tall? Of course not. The medium is the message. The true purpose of Mt. Rushmore, which of course lies beyond mere physicality, is to express the greatness of the presidents whose faces are carved into the mountain. In this task its "inefficiency" due to its size actually accomplishes its purpose, in expressing the greatness of these men with the physical greatness of their sculpted likeness. In the same way, the "inefficiency" of the universe actually accomplishes its purpose, by helping us humans understand and glorify God. Next, consider the Large Hadron Collider (LHC). One of its purposes was to discover the Higgs boson. Upon comparing the mass or the lifetime of the Higgs boson to that of the Large Hadron Collider, you would find that the LHC is very "inefficient": it is much more massive and lasts much longer than a Higgs boson. Now, could you use this fact to argue that the LHC doesn't have a purpose? Of course not. The true purpose of the LHC is not mere physical detection, but the increase of our knowledge. Ignoring the knowledge component and simply focusing on the Higgs boson is the mistake of a simple reductionist, which then leads to the erroneous conclusion that the LHC doesn't have a purpose. Likewise, by ignoring the spiritual component and treating humanity as merely matter, you would reach the erroneous conclusion that the universe doesn't have a purpose. Additional examples abound. The pyramids were built to give the Pharaohs a feeling - to release some tiny amount of chemicals in their brains. Your sound system, like your computer monitor, is massive compared to the energy it puts out as sound waves. Radio telescopes are massive compared to the energy of the radio waves they detect. Enormous film sets are built, only to occupy a tiny volume in a data storage device as a video file. All of these are "inefficient" if judged according to the flawed thinking at the start of this post. Yet despite their "inefficiencies", we know that all these things do in fact have a purpose. So, the thinking that the "universe is too big to have humans as its purpose" is immediately falsified upon direct comparison to many things that are known to have a purpose. According to this thinking, your computer, Mt. Rushmore, the Large Hadron Collider, and many other things must all be without a purpose. At the heart of the mistake in all these cases is the idea that matter is the only thing that's real. This is why, in all of the examples given above, the mistake comes from computing efficiencies by comparing matter to matter (or energy to energy, which is the same thing). The remedy is to open your eyes to the higher levels of reality, such as knowledge, information, or emotion, each of which can be responsible for arbitrarily large amounts of matter. In the same way, the mistake about the purpose of the universe comes from thinking that physical things are the only real things, that the universe and humans are merely matter. It is remedied by opening your eyes to spiritual realities. Another thing that all of the above examples have in common is that the purpose of an object is ALWAYS something outside the object. Computer monitors exist for a purpose outside themselves: for your eyes to see what's displayed on them. The Large Hadron Collider exists for a purpose outside itself: to provide knowledge to the human brain. Look around you right now: pick any random object that has a purpose. At this moment around me, I see a wood screw, whose purpose is to hold together things that are not itself. I see a lamp, whose purpose is to illuminate something else other than itself. There are some keys, which open things which are not the keys themselves. A pen writes on something other than itself, and a napkin cleans something other than itself. For every object with a purpose, that purpose can only be found outside of itself. Therefore, in looking for the purpose of the physical universe, it is futile to search inside the physical universe itself. No amount looking at things inside the universe - atoms, stars, cells, or quasars - will ever turn up the purpose of the universe. The fact that science hasn't found the purpose of the physical universe tells you precisely nothing, because this is exactly what you'd expect even if the universe did have a purpose. As with everything else, if the universe has a purpose, that purpose must lie outside the universe itself. However, once you accept the possibility that the universe does have a purpose - once you've rejected the reductionist thinking that forces you to conclude against a purpose from the onset - it is possible to look for the purpose of the universe. Not by searching within the universe, but by using the universe to evaluate things outside of it. That will be the subject of next week's post. The following is the timeline of events in the history of our world, as best as I understand it using my model. Afterwards, I provide links to all the other posts about my interpretation of the creation story, in connection with the timeline. This post therefore serves as the conclusion and a links page for the entire series of posts on interpreting the Genesis creation story. God, in his love for his son, wills his eternal plan - to glorify Jesus Christ through the creation and salvation of us humans. To that end, he loved and chose us in Christ before the foundation of the universe, and sent Christ to be incarnated, crucified, and resurrected in the world. Thus the universe was made for Christ and through Christ. This event, taking place around 13.8 billion years before Christ, is synonymous with the creation of the universe in our current scientific understanding. It is the earliest event for which we have physical evidence. It is indeed the earliest event that's theoretically possible, as it's what created all space, time, and matter. In creating the universe in this way, God made its every aspect through Jesus and for Jesus. Thus every feature, law, and parameter of the universe was designed so that Jesus could be incarnated into it, to carry out his eternal plan of salvation. The solar system was created in the debris of some exploded star around 4.6 billion years before Christ. The Earth itself was created to have features that allows Jesus, and therefore us, to exist on it. Thus the stage was set for the Gospel story. Life perhaps began something like 4 billion years before Christ. There is still much that science does not know about this event, as we're faced with the monumental difficulty of solving a molecular mystery from billions of years ago. Regardless of the details, God planned and guided this event so that, as with everything else, it would serve to tell the story of the Gospel of Jesus Christ. Life evolved for many years, until God created anatomically modern humans around 200,000 years before Christ, and behaviorally modern humans around 50,000 years before Christ. In this way, God prepared fitting vessels for his own Incarnation, and for the other fellow bearers of his image. God imparted his image onto two specific humans, Adam and Eve, several thousand years before Christ. Though they sinned and fell away from God, he did not abandon them, having chosen instead to work through their sins before the foundation of the world. They would go on to become the ancestor to all humans on the earth, and therefore to Jesus Christ himself. I am writing this on October 13th, in the year of my Lord 2014. These are the last days - in that they are between the climax and the ending of the story. But there is plenty for us to do: we are to live out the Gospel, and in so doing, make disciples of all nations, even to the ends of the world. Indeed we are given a better picture of the whole story because we live in its end times, and this clarity drives us to work out our salvation to ever fuller extents. So we work, wait, and hope. Come, Lord Jesus! As with the beginning of Genesis, the Bible mostly uses imagery and symbolism to show us the ending of the story, in the Book of Revelation. We do not know much of the details, but the big themes are clear. They are all in accordance with Christ's finished work on the cross, so that Christ may truly be the Alpha and the Omega, the beginning and the end. Here are the broad strokes we know: the world, as we know it, will end. Everything will be new. And God himself will be with us. That covers the Genesis creation story. It is only a part of the beginning in the story of the universe. The other parts of this story - that is to say, the Gospel story - is told elsewhere, as I have linked in the timeline above. This post is a continuation of the previous post: we are examining the fit between my model of the Genesis creation account and the other parts of the Bible. The "sons of God" were the descendants of Adam and Eve, fully spiritual humans bearing the image of God. Most of the "humans" to whom daughters were born were merely biological humans, who would have significantly outnumbered the descendants of Adam and Eve at this time. As the population of both the spiritual and biological humans increased, they started interacting with increasing frequency. Marriages between them were very common, and there was nothing wrong with that, as it was a part of God's plan to make Adam and Eve ancestors to all of humanity. Now, as I previously mentioned, the descendants of Adam an Eve enjoyed many mundane, material advantages that flowed down from their spiritual identity. They would have been wealthy, powerful, and respected among the merely biological humans. And as powerful, fallen men have done throughout history, they indiscriminately slept with any beautiful women they wanted. It was easy for them to take these women from among the relatively weaker biological humans. These unions then produced children. Now, this was not according to God's plan: remember that in my model, the image of God is propagated through spiritually formative relationships, such as fatherhood. But these men, who slept with any women who caught their fancy, would have made terrible husbands and fathers. Many of their children would have then grown up with the warped spirit that comes from having a bad father. As this process repeated itself over several generations, the people born and raised in this wicked way multiplied. Eventually, their wickedness would bring about God's judging flood. But not everyone conformed to this pattern. There were still exceptions. So, on rare occasions there would still be a son of Adam and Eve who married a biologically human woman and loved her properly. The children born from their union would have been raised right, and so they would have enjoyed all the advantages that their father passed on to them. If these children then lived among the merely biological humans, they would have been considered exceptional individuals. As fully spiritual humans who also possessed many mundane, material advantages, they would've been capable of remarkable feats. These were the Nephilim: heroes of old and men of renown, as they would have been known among the biological humans. Now, of course I can't be certain of all this. The fact is that the Bible simply doesn't give us enough information in this short passage at the beginning of Genesis 6. This is a problem for any interpretation of this passage. However, my interpretation has the advantage that it flows quite naturally from its basic assumptions: Given that fully spiritual but fallen humans lived alongside merely biological humans, this is what you'd expect to happen. 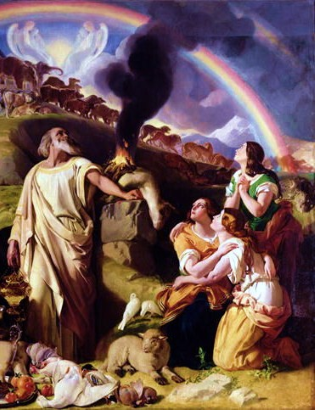 It also has the advantage that the elements of the story do not pop out of nowhere: in my model, "sons of God" and daughters of "humans" were present from the very beginning, and the interaction between these groups were mentioned in the earlier parts of Genesis, as I described in the previous post. That now brings us to Noah's flood. Interpreting the flood with the full treatment it deserves would take another several posts, and I would mostly be repeating what others have already said. But for the sake of completeness, I will briefly mention that my model requires the flood to be localized, and that I trust the expertise of others when they say that a local flood fits with the language of the biblical text. Now, I don't know Hebrew, so I'm not qualified to judge these statements by experts. But I can say that a local flood agrees well with the established principles of Bible interpretation: it makes no sense to interpret the flood with the modern meaning of "globally", when the original author and audience were not aware of the globe of the Earth. The animals also make more sense in a local flood: if you were to apply the modern taxonomical definition of 'every animal', and the modern definition of 'the whole Earth', it is simply impossible that all the animals fit in Noah's ark. Of course, reading the text this way is a pretty blatant violation of the rules of Bible interpretation: you're completely taking these words out of their ancient context and reading into them our modern meaning. If you instead interpret the story as the original author, audience, and characters would have understood them, then everything fits: the flood was local. The animals were only the types that were endemic to the region, as classified by one family with an ancient understanding of biology. So penguins and koalas were not on the ark. Probably no tigers, giraffes, moose, or elephants either. And all types of rats, mice, and squirrels might have been classified as one kind of animal. The ark was sufficiently large in this case, and it needn't be responsible for the biodiversity of the whole planet. After the flood narrative, there is the story of the tower of Babel, in which God scatters the people over the face of the earth. In my model, this is one of the events that allows Adam and Eve be become the ancestor of humanity much more quickly than would otherwise be expected. Also, note that these people would have been scattered into areas which would have already been populated with biological humans. This explains a curious feature of the flood narrative - that there are similar, but not identical, flood myths found all over the world. As the descendants of Noah spread out after Babel, they would have carried with them the story of the flood. It would have been the most catastrophic, dramatic, and morally important event in these people's history. But as they then mixed with the locals in their new area, the story would have been distorted and sometimes forgotten: if all four of your grandparents tell you the same flood story about how the world was nearly destroyed, you'd be sure to tell it to your children in the same way, as part of the oral history of your people. But if only one of your grandparents, who used to live in a different part of the world, told you the flood story, it's much more likely to be distorted, mythologized, or forgotten - and this is the way we find the story today. As for the passages outside of Genesis, my model is in harmony with all of them. There are many passages which briefly describes how God created the world (Jeremiah 10:12, Isaiah 45:18, Hebrews 11:3, etc. ), all of which my model affirms. My model also agrees with Acts 17:26 that he created every nation from one origin, as we're all descendants of Adam and Eve. My model furthermore agrees with all the verses that use creation order arguments to discuss doctrinal matters, such as Matthew 19:4, Mark 10:6, 1 Timothy 2:13-14, and 1 Corinthians 11:8-9. With a historic Adam and Eve, along with generic humans being created as male and female during the sixth "day" in the Genesis prologue, my model fits all these verses. Additionally my model is in harmony with verses which talk about the flood (1 Peter 3:20, 2 Peter 3:5-6), as a historical event through which some humans were saved. And, because my model is compatible with mainstream science, it is also in harmony with all the verse that describe science. Lastly, my model is in perfect harmony with the important verses that describe our salvation, 1 Corinthians 15:22 and Romans 5:12-21. My model affirms a historical Adam, who became the ancestor to all humans, whose sin therefore infects all humanity, which results in spiritual death. So, there are many verses that are explained best by my model, while there are no verses which give my model any exceptional difficulty. All this, combined with the biblical texts that I have discussed at length elsewhere in this article series, means that my model is in excellent agreement with the whole of Scripture. In fact I believe it to be the most biblical model among its rivals - otherwise I would not believe it. As I said previously, there are people in my personal life whom I respect - many who are more knowledgeable and more godly than I - who hold to a different model for the Genesis creation story. I respect their views and the other ways of interpreting Genesis. I am therefore still open to modifying my thinking - pending better exegesis, clearer interpretations, better understanding of the original language, and a better historical and cultural understanding of the biblical authors and audience. But with the best evidence I have now, with the best understanding of the Bible I can currently attain, and having done my due diligence, I believe that my model, among its rivals, is the closest to the truth.